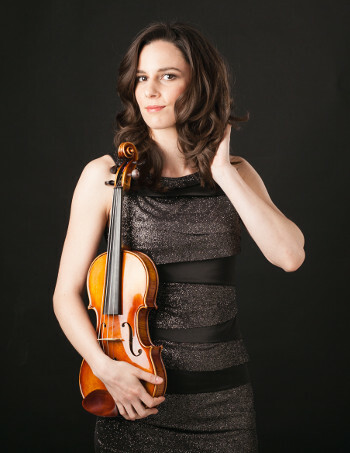 Born in Poland, Barbara Dziewięcka-Data is a concert violinist and a chamber musician based in London. Recently, Barbara recorded an album called „Havana Classics” with the Latin ensemble Classico Latino she regularly works with. The recording took place in July 2018 at the iconic EGREM studios in Havana, Cuba. With a guest artist, jazz violinist Omar Puente and local musicians, this new album, to be released in 2019, will channel the tropical spirit of old Cuba with a unique classical twist. Barbara is privileged to work and perform with Nigel Kennedy since 2010, as a member and co-leader of his “Orchestra of Life”, as well as individually. Most recently she performed at his Gala Concert at the Royal Albert Hall with Jean-Luc Ponty and the Led Zeppelin’s star Robert Plant. Barbara also was a viola section leader at the BBC Proms at the Royal Albert Hall in 2013. She performed solo with Kennedy on numerous occasions including Barbican Hall and on tour. In 2012 she recorded at Abbey Road Studios for his album ‘Recital’ for Sony Classical. Intensive touring with Nigel Kennedy has taken her to Berlin Philharmonic, Cologne Philharmonic, Munich Philharmonic, Staadcasino Basel, Palais des Congress in Paris, Birmingham Symphony Hall, Royal Festival Hall, Royal Albert Hall in London and many more. She also participated in a recording for Sony Classical of A. Vivaldi’s New Four Seasons in 2011. Barbara’s orchestral experience includes working with the BBC Symphony Orchestra and Oxford Philharmonic Orchestra, among others. She took part in projects conducted by Valery Gergiev, Jiri Belohlavek, Semyon Bychkov, Marin Alsop, Sakari Oramo, Francois-Xavier Roth, Vasily Petrenko, Sir John Elliot Gardiner, James Gaffigan and others. She participated in various international masterclasses with renowned musicians like Rainer Schmidt, Richard Ireland, Kevin Kenner, Helene Dautry, Kaja Danczowska, Jan Stanienda, Adam Korniszewski, Leonid Kerbel, Mari Tampere-Bezrodny, Michael Vaiman, Rivka Golani, Tomasz Tomaszewski, Belcea Quartet, and Chillingirian Quartet. Barbara also shows her interest in other music genres, and performed with artists such as Quincy Jones, Robert Plant, Jean-Luc Ponty, Joss Stone, Pete Tong, Jonas Blue and others. Although she’s been classically trained, her interest in improvisation and jazz has taken her to venues like the Vortex, Ronnie Scotts, Pizza Express in Soho in London, Bestival in the Isle of White, London O2 Arena. Together with her ensemble A Piacere Trio she co-founded The Ultimate Tango Project, and recorded an album with Astor Piazzolla’s tangos in original new arrangements with an innovative approach to interpretation, flavoured with improvisation. Barbara is a winner of numerous competitions and awards including The Audience Prize at St. Martin in the Fields Chamber Music Competition in London, 1st prize and Philip Carne Foundation Prize at RCM Competition ‘Ensemble with piano’ in London in 2013, 2nd prize at St. Hajzer Bach Competition in Zielona Góra in 2002, 3rd Prize at Irena Dubiska Violin Competition in Łódź in 2002, and 1st prize at the Competition for Young Violinists in Limanowa in 1998, in Poland. Barbara came to study in London in 2006, after she was awarded a full scholarship at the Guildhall School of Music and Drama in London where her teacher was Krzysztof Śmietana. She completed the BMus (Hons) course and got a distinction for her principal study in 2010. In 2012 Barbara graduated from the Royal College of Music in London where she completed Masters in Performance course studying with a renowned teacher Itzhak Rashkovsky, holding RCM scholarship. During her education she was generously supported by City of London Corporation, Music Hostel Trust and Concordia Foundation.